Topics: Dremel Burnishers, and Burnishers For Drills. On average 3.00 pages are viewed each, by the estimated 33 daily visitors. 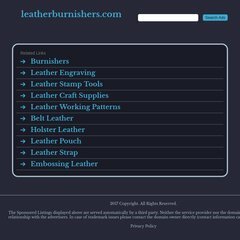 iilg.net International Internet Leathercrafters&apos; Guild, Inc. It has 2 DNS records, ns67.domaincontrol.com, and ns68.domaincontrol.com. It is hosted by Godaddy.com Inc (Arizona, Scottsdale,) using Apache web server. Its IP Number is 72.167.232.14. PING (72.167.232.14) 56(84) bytes of data.